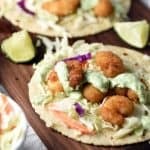 These Popcorn Shrimp Tacos with Cilantro Lime Sauce are so delicious and a lifesaver for busy weeknights! 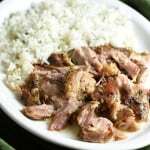 This recipe was developed by me for SeaPak. All opinions are 100% my own. Thank you for helping to support the brands that I love and make Belly Full possible! Oh summer. You slay me. Oh wait. I never sleep in. Neither do my kids. Scratch that last one. But we are somewhat lazy – I mean, as lazy as a Type A family can be. A lot of the rules about bedtime, snacking, and screen time go out the window. Sometimes intentional…and sometimes not! And even though I have more time to cook, I’m way less motivated to. 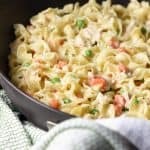 I rely more on breakfast for dinner, pasta salads, and make-ahead meals. And definitely more frozen items. I’m so thrilled to have partnered with SeaPak today. Love, love, love all their products. 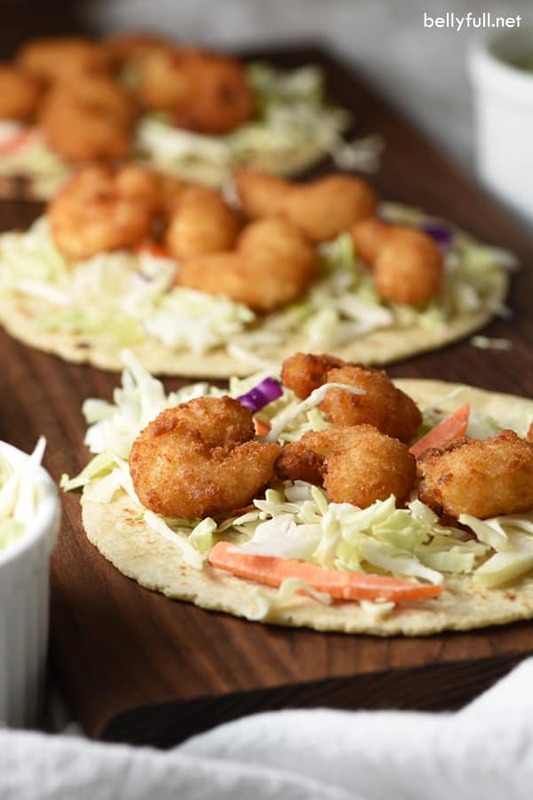 They were a lifesaver when first introducing the kids to seafood, who couldn’t seem to get on board with most cooked fish, but absolutely loved their breaded shrimp. I always have a couple packages of their popcorn shrimp and jumbo butterfly shrimp on hand for days when I lack time or energy. 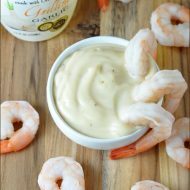 SeaPak paired with some fresh ingredients are the perfect combo for making a quick, healthy meal. 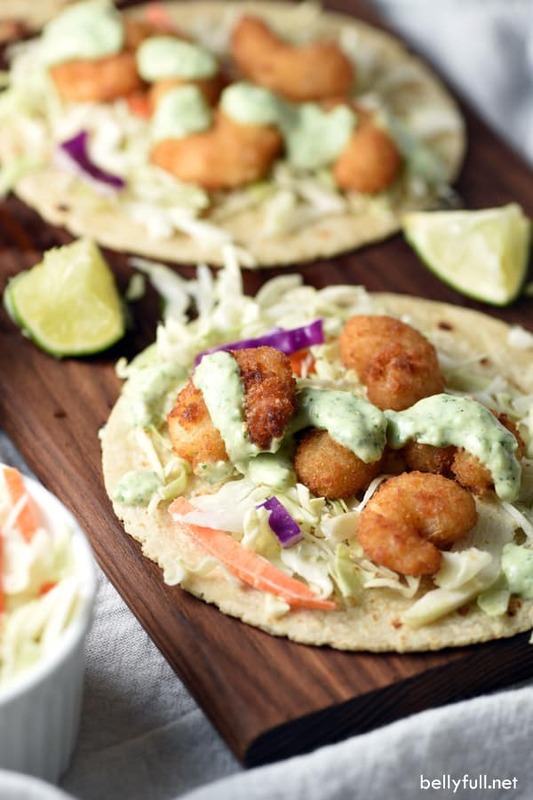 I make cheater po’ boys all the time, but these Popcorn Shrimp Tacos with Cilantro Lime Sauce were a great change up and a huge hit with my family. 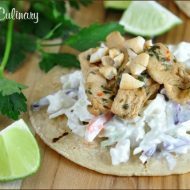 The fresh coleslaw, cilantro lime sauce, and tortillas are the perfect summer accompaniment. 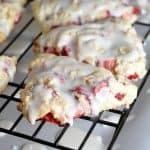 We enjoyed them out on the patio, which is also always a hit with the kids! 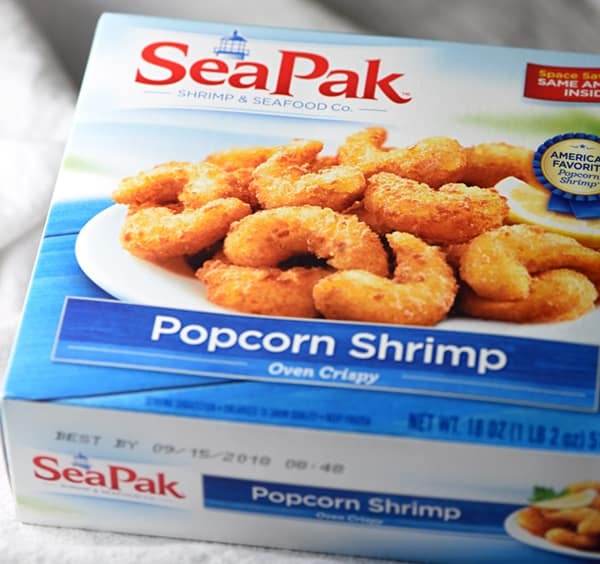 To find SeaPak products near you, head to the product locator on SeaPak’s website. Follow them on Facebook and Instagram. And make sure to sign up for SeaPak’s Coastal Catch e-newsletter so you won’t miss a deal! You’ll receive a coupon just for joining! Preheat oven to 450 degrees F. Spread the popcorn shrimp on a large baking sheet and cook according to package directions. Place the cilantro, garlic, jalapeño, mayonnaise, sour cream, vegetable oil, lime juice, vinegar, salt, and pepper in the bowl of a food processor; pulse until combined and smooth. Warm the tortillas in the microwave or over the stove burners until just slightly charred around the edges. Top with a little coleslaw and 5 or so shrimp. 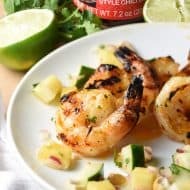 Drizzle with the cilantro lime sauce. Type A family. Heh. ;) Man, these remind me of my other favorite California tacos (fish being the first obviously). And I am all the way down for using these frozen fried ones. Going on my list. They’re too easy not to make, Melissa! And so delish.